A Brief Blast of Warm Air and Bees Are Flying! Weather in Kentucky – from the deep freeze to the balmy 60s and back again. Yesterday my bees were flying and today is almost as warm. I did not see bees bringing in pollen, but would not have been surprised if I had. A beekeeper friend in Bowling Green, Kentucky sent me this photo. The temperature there reached 70°F and his bees were evidently finding pollen from some source. What is blooming now? I suspect this is from dandelions, which flower pretty much year round here in Kentucky, but comment if you think it may be from another plant. While this warm weather is to be enjoyed (I took my daily walk outside yesterday, instead of on an indoor track), it won’t last. The forecast in Central Kentucky calls for a high of 22°F tomorrow (February 1st). My winter honeysuckle has been blooming for a while. 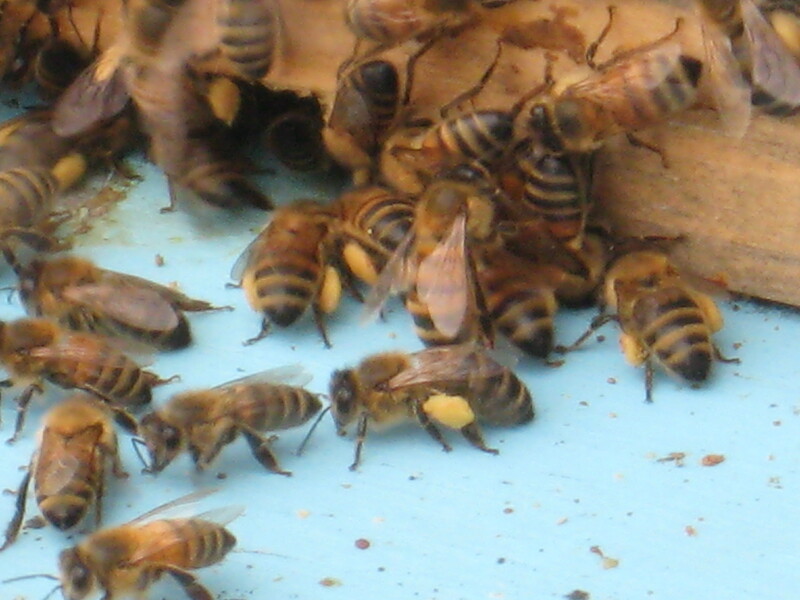 Honey bees glean plenty of pollen fom it on those warmer days. I’m in Nelson county. My bees have been bringing in pollen on most of the days when temperatures have been above 40 a couple of days in a row. I am seeing the yellow pollen coming in but also red which I think is possibly henbit. I have also seen henbit florets on the bottom boards. It is that time of year! The new beekeeping season will be here soon.